There are some rewarding benefits for mastering HTML5. With enough experience, you could become a freelance front-end developer and earn money from developing websites for others, but an essential thing is that HTML5 gives you the power to create whatever you want on the web. Perhaps whatever is a broad term, but in terms of website development and design, HTML5 is your best chance at having success. Wonderful frameworks exist these days that can be complemented with your HTML5 knowledge to build unique and dynamic digital experiences. Many veteran and expert developers have published books on how to become a front-end developer — someone who knows CSS and HTML — and while these books are great, they can rather quickly fall behind the times of what is happening in web development right now. Neither of the two languages — HTML or CSS — are static, but always changing and are being improved to deliver more refined tools and techniques for building modern day websites. So with that approach, a nice alternative for learning HTML5 is through web tutorials, guides and walkthroughs on how particular features work, or how a particular design was achieved. We’re giving you the best of the best, most recent and most modern tutorials, but also resources, on how to become an HTML5 pro in a matter of weeks. If you’re planning on studying HTML5 and front-end web development in general, you will inevitably have to learn about User Experience, and pretty much everything that it has to offer. It’s nice to be able to write neat code, but it’s even nicer when the code that you’re writing reflects your understanding of what a solid user experience should feel like for websites and apps. These days countless experts spend their time analyzing page performance and the latest insights in what makes a user stay on the page, and what makes them leave the page. 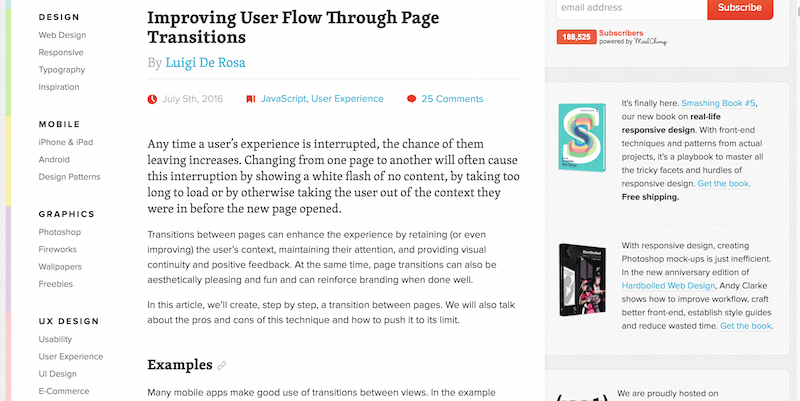 One of the latest research case studies shows us that page transitions could be improved to deliver a refined user experience. Traditionally we rely on the default transition which is when we click on a new page of the website, and we have to wait for the browser to reload that page. Although some themes and developers are catching up to how inefficient this concept is, we won’t see this global change of how page transitions are viewed change anytime soon, unless of course, we’re going to try it out for ourselves and gradually spread the word about it. Within this tutorial you’ll find the required tools and information on how to amplify your page transitions so that the browser doesn’t have to do a hard reload for every new page that your visitors are opening, a stunning enrichment to the global user experience that your desktop and mobile apps are providing. What is real and authentic responsive design? Is it a set of blocks and elements stitched together with some minimal responsive design properties attached to them? There’s so much bad design going around these days, and while it looks funky on the outside, if we take a deeper look at the codebase on the inside, many of the leading websites we see today completely avoid any structural setup for the way that the design of a page is presented, which means trouble for those who have to come and fix that code afterwards. 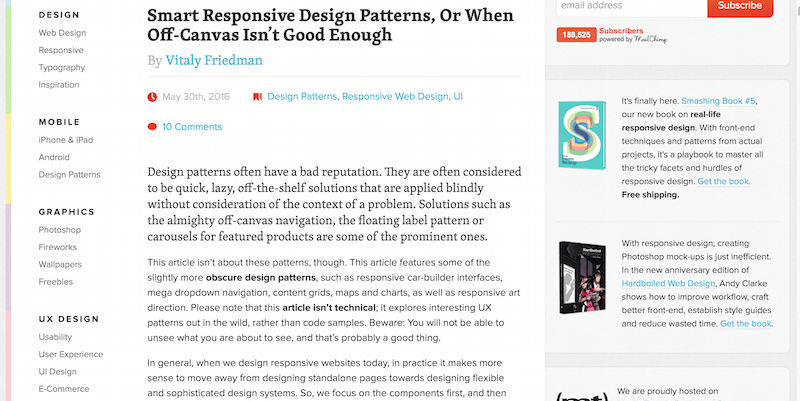 This article is less technical and richer in examples of how different websites are messing up responsive design patterns and are technically providing a worse off experience this way. 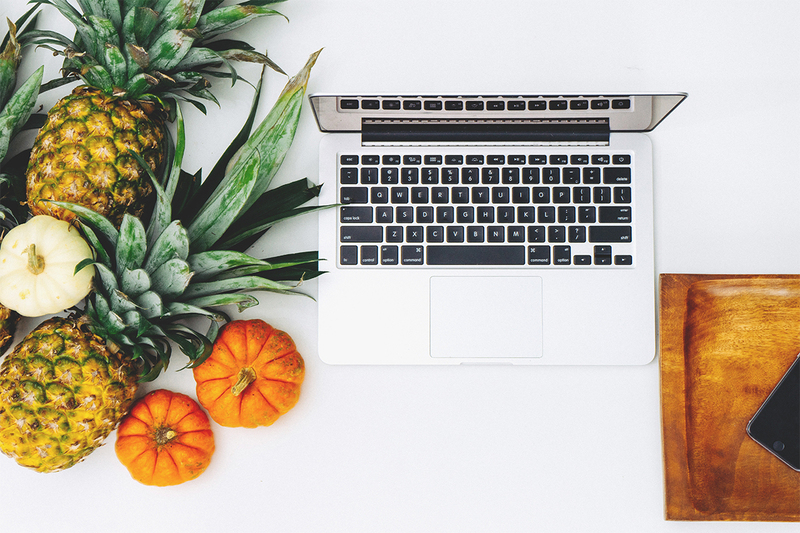 As an HTML5 developer, you will want to know the design patterns to avoid, and the methods to use in order to structure your projects better for maintainability to flexibility. Designing good forms will net you some reputation points from fellow developers, but not only them. With such vast growth of browser capabilities, users are slowly getting accustomed to stuff like automated forms completion. Think of doing any purchases online, if you’re an avid Google Chrome user then you’ll know that Chrome can save your credit card details for later, for easier access. That kind of form design really makes a difference in how users view the browser they’re using, but also how open is the website owner to such autocomplete efforts; it’s possible to block them out, but mostly they’re available. 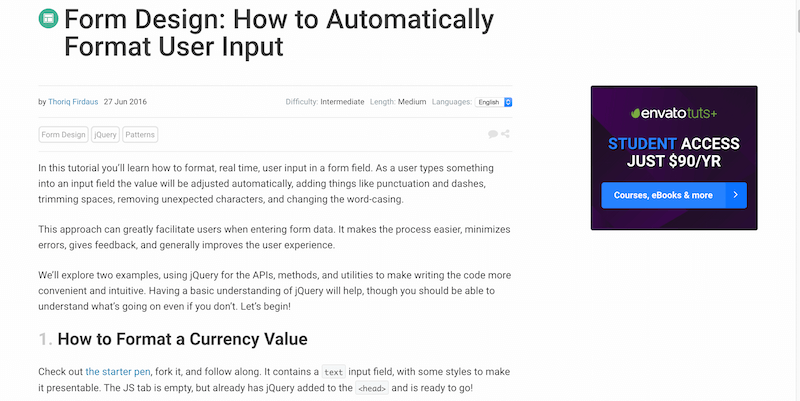 This tutorial from Thoriq focuses on the autocomplete forms function whenever a user is typing something in real time. This could be a serial number, a date of birth, or a string of characters that you require. 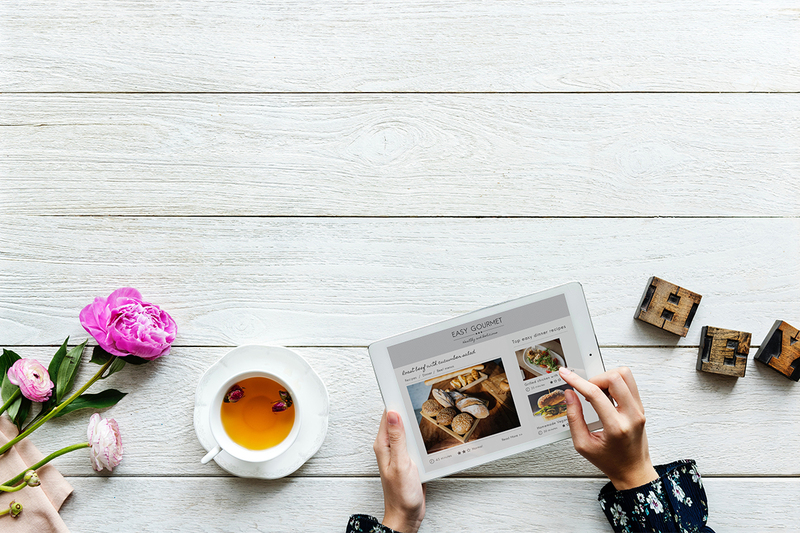 Having an automated autocomplete and auto-sorting function can really make a lasting impression for users who are first-time visitors. Sometimes it can even be helpful to your own project’s database, as you avoid having users enter silly data and instead autocorrect it as they’re typing it. Flexbox is now the official king of layouts in web design. 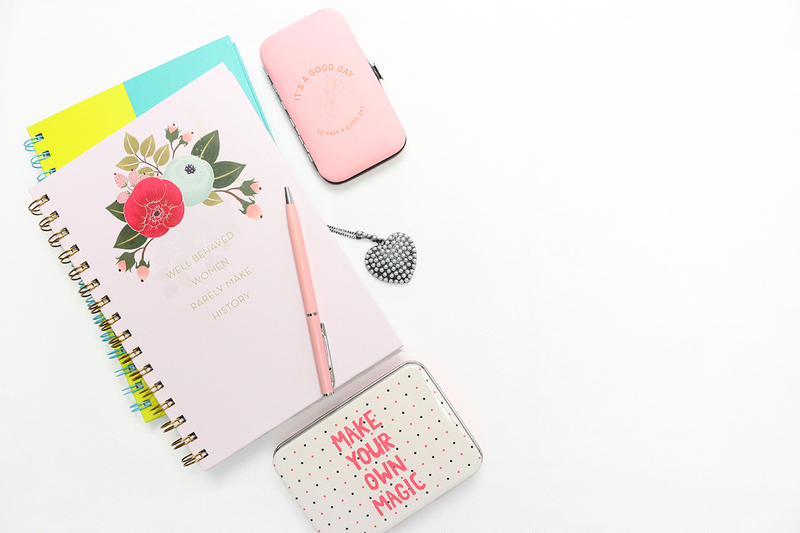 This wonderful little property can help you design a page that will have impeccable pixel and dimension clarity, from whichever device the particular website is being accessed from. A good way to explore the possibilities of Flexbox is through tutorials, they’re often concise and provide many examples of how different grids and rows of design can be adjusted for perfect display on a page. 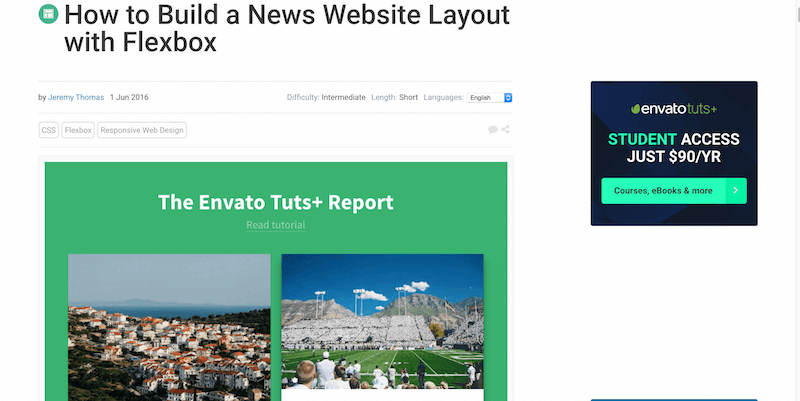 Jeremy Thomas put in the work to produce this following tutorial of building a layout for a news website or a news magazine using only Flexbox layout properties. Learn how to create responsive columns, how to adjust their dimensions for design clarity, and how to move content around without sacrificing appearance. Finding the right animation tool for you can be a tricky process, only because there are so many wonderful choices to pick from! Browsers are getting better at supporting animations, and developers are certainly taking full advantage of that through pushing the limits of how animation can be used in web design. This post explores two solutions, React Animations and Browser Native Animations — the tools covered are: CSS, Canvas, SMIL, Web Animations API, WebGL, GreenSock, Velocity.js, jQuery, Snap.svg, Three.js, Bodymovin, React Motion, and GSAP. There’s a concise explanation of the pros and cons for each of these tools, so get clear about your goals and take your pick. 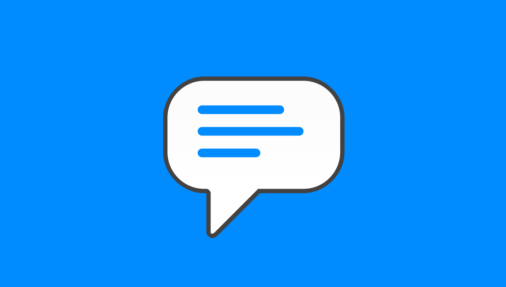 Some wonderful and insightful comments are at the bottom of that post so you can learn a little bit more about each of the tools there, while also explore different suggestions that weren’t covered in the post itself. Social media is an inevitable part of a well-structured design, losing on social shares because of lack of social widgets is just plain dumb, irrational to say the least. This post doesn’t, however, focus on cute social sharing buttons, and instead, focuses on a new aspect of social sharing known as social meta tags. These meta tags can be used to help you create socially aligned content that would get displayed in a more refined manner on the particular social network. For Twitter we know it is Twitter Cards which allows us to share our posts to Twitter and have the image/description appear next to the comment we’ve written, for Facebook it is sort of the same thing, with the exception of being able to attribute proper author credit which could be linked back to the person’s official Facebook account. 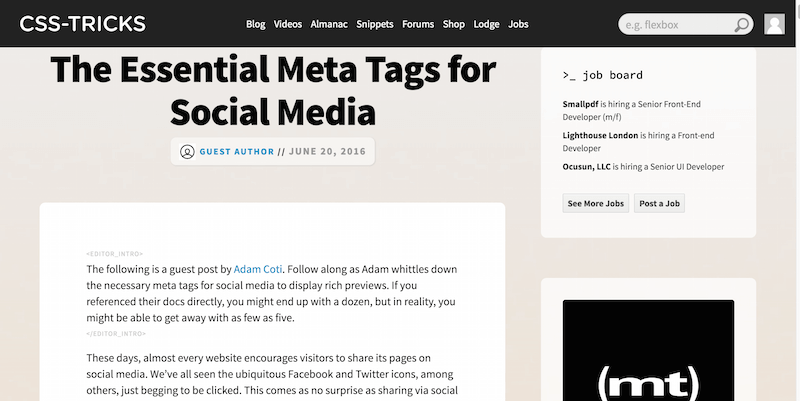 This is a thoroughly in-depth guide on how to achieve that meta tags precision so your posts get more exposure on your friends and followers social media walls. Do you ever wonder how websites create social sharing widgets that stick at the bottom of the page when you’re scrolling up and down a particular page? It’s called a sticky footer! Just like sticky header navigation bars, sticky footers have become extremely popular amongst those who want to expose essential information more conveniently, for some it is the exposure of social sharing buttons, some use the sticky footer functionality to show their email newsletter form, others will use it to broadcast important news about business, product, or the site in general. 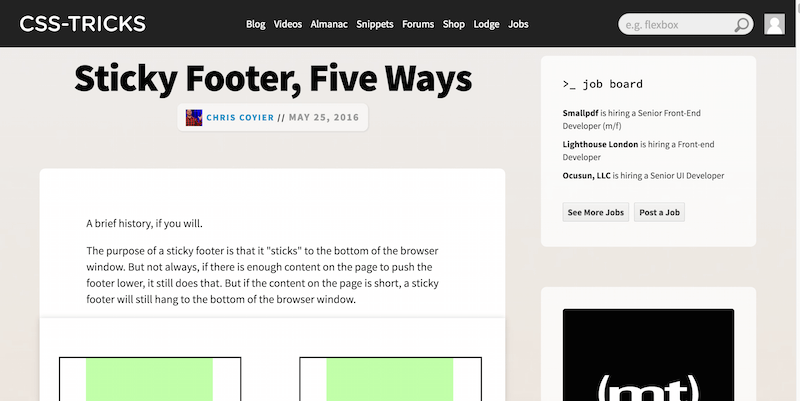 The uses for one are quite a few, so let your creativity run wild with this one as you learn five unique techniques for achieving the sticky footer on your own website. Those include negative margins (two versions), using the calc() feature, implementing with Flexbox, or using a global Grid. Getting your file uploads right is essential, a large portion of websites these days manage some form of file upload, either for personal profile use or for the use of the site-wide features list. Even when you make a portfolio website for yourself, you might want to implement some form of file upload in order to make it easier for you to attach new portfolio items. It doesn’t take too long, and HTML5, in fact, makes it incredibly fast, secure, and convenient. 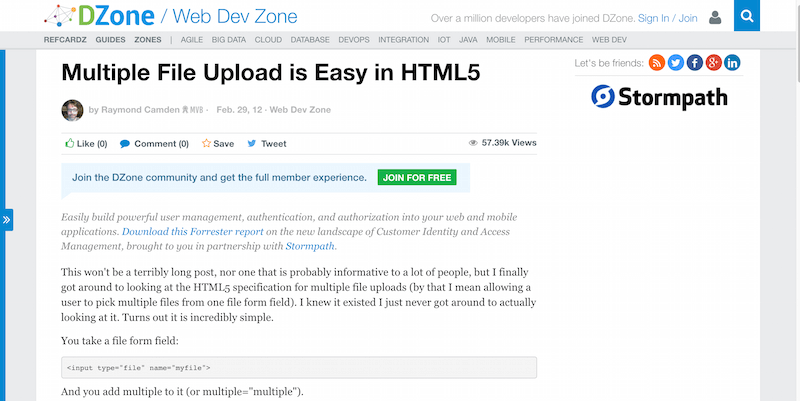 In this tutorial from Raymond, you will learn how to create an HTML5 file uploading form that is capable of uploading multiple files at once, it’s a nice snippet of code that can be quickly readjusted and reused in different settings. Building a mobile app is these days the dream of many, go sit around your local digital tech guy cafe and you will find dozens of nerds sitting at their computers hacking away a functional demo of their first mobile application. These days mobile apps are a huge business, and job opportunities are everywhere, even at large tech companies that rule the market. Getting to that level is, of course, a challenge, but hardly ever anything good comes out of situations where a challenge isn’t presented. 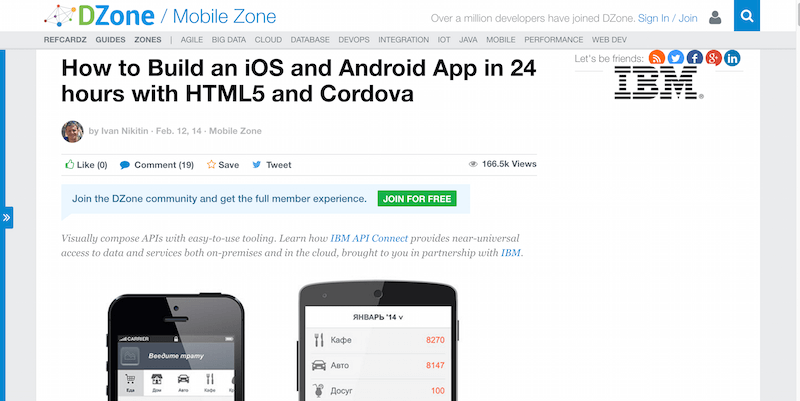 This tutorial for building an Android/iOS app with Cordova focuses on a fast-paced approach to getting a working mobile app preview ready for your friends, so you can see where you stand with your ideas. All the big names in video content industry are starting to switch over to HTML5 Video for better browser performance, YouTube being namely the dominant video platform that made the switch from Flash to HTML5 a few years ago, and to this day they continue to improve their ecosystem in order to provide better video watching experience. Kristof explains a very quick and easy tip for how to configure your web server so that it supports HTML5 file types, because otherwise you might try to load HTML5 video content and it won’t show up at all. 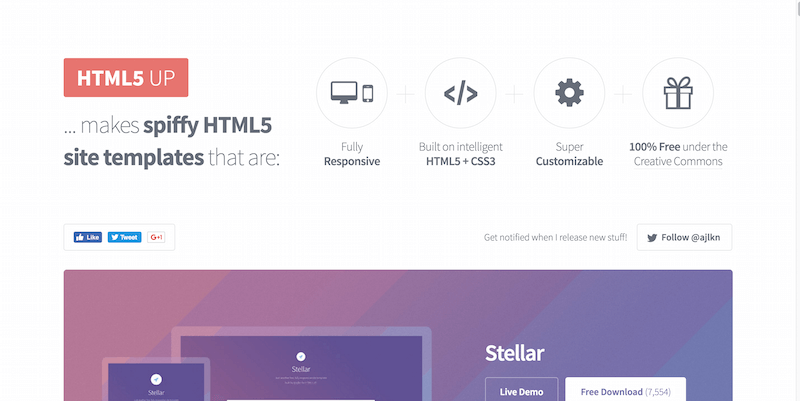 HTML5 Bookmarks saves you from having to constantly visit web development blogs to learn about the latest tools, libraries, and plugins that are becoming available for the free market. 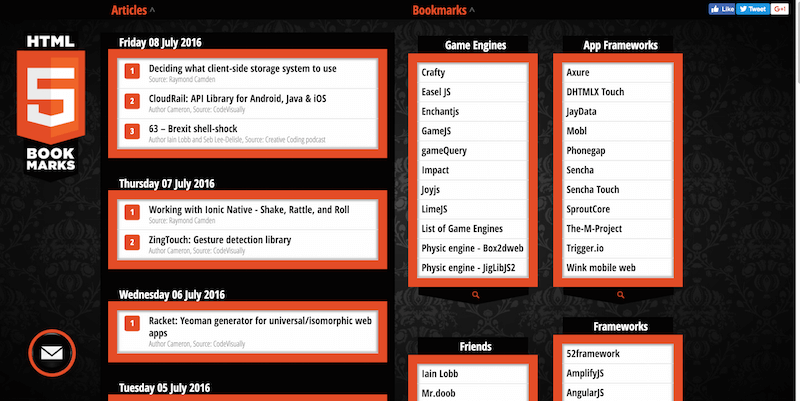 Apart from listing a daily link to the latest cool tool, HTML5 Bookmarks also has a sidebar widget which lists out important frameworks, engines, resources, and links for everything related to HTML5. Some days there are more than one links, and usually, there’s at least one. Through this bookmarking site, you can learn about the kind of tools that are becoming available, and you could even get your own tool submitted and enlisted if you have been working on something particular for a long time. Tutorials are the straightforward resources for learning about individual aspects of a particular programming language, with a tutorial you can not only explore the tiny aspects of a particular concept but learn how to apply those aspects in other parts of your projects too. 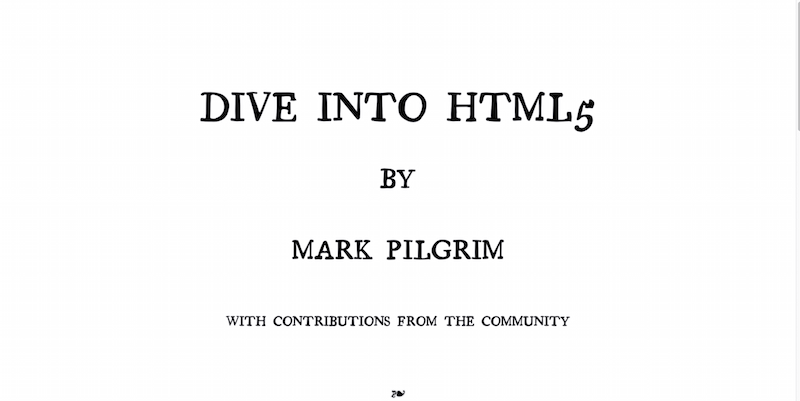 Dive Into HTML5 is a free online book that introduces you to HTML5 and explains in thorough detail how to go from being an HTML5 newbie to becoming a confident professional who can handle his own when it comes to building websites and HTML5 apps. You get great coverage of HTML5 history, important concepts, how to use animations, videos, and in general everything that you’d typically encounter when reading a tutorial anyway. 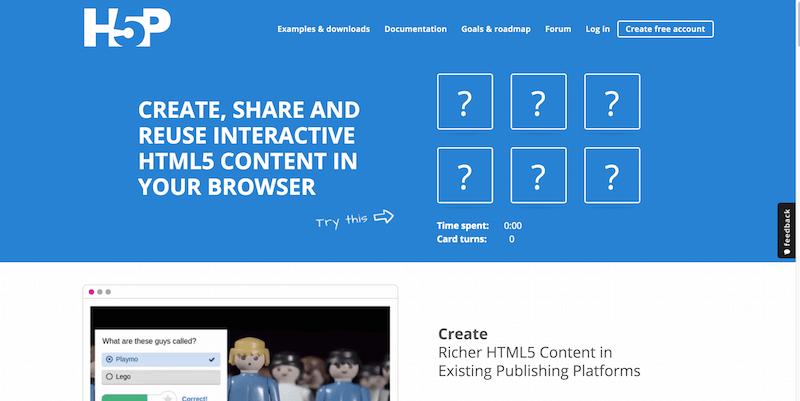 What else can you build with HTML5 except for websites and apps? How about mobile games? The market for mobile games has exploded and single-handedly is responsible for the success of the many app store markets we have today. Learning to create your own HTML5 game starts with understanding how HTML5 interacts with the browser, at which point you can start exploring the different HTML5 game engines to start building your first game terrain. If such a venture is of interest to you, then don’t be shy to visit the HTML5 Game Devs forum where you can learn, connect and brainstorm with other game developers, all of whom use HTML5 to complete their projects. It’s a great place for learning about the latest news in the industry, but also to learn about the ways that people use software to build games. A few years back you would have had to use Flash to create a fully animated website, these days it can all be accomplished through HTML5 and CSS3 — and each day designers are pushing the limits of these languages to provide even more concise experiences that reshape the way we understand animations on the web. Having a static website is fine, but having animations on your website could add a few extra points where credibility is concerned, even simple transition effects can be considered animations, and knowing how to use transitions is the first step in making apps and websites that feel smooth, clear, and easy to navigate. This humongous resource you’re about to explore is packed full with interesting and resourceful information about web animations, what kind of libraries you need to make them work, and how they generally interact with the browser. You’re only a few steps away from becoming a mastermind of animation design. Practice makes perfect, it really does. Whenever you undertake a new habit or a skill — you’re bound to run into experiences that refine your understanding of that particular undertaking, sometimes you learn the things to avoid, sometimes you realize how to get things done faster and better. It’s all a game of time, and programming certainly falls into that category of learning as you go. HTML5 as any other language can provide challenges, it can confuse new developers with the best ways to approach design things, and not often do you get those things explained in a tutorial, oftentimes everyone uses their own approach to build stuff — one of the many reasons why people used to hate (or maybe still do) PHP so much, because of how diverse it was and how flawed was the written code as it was made by tons of different developers. 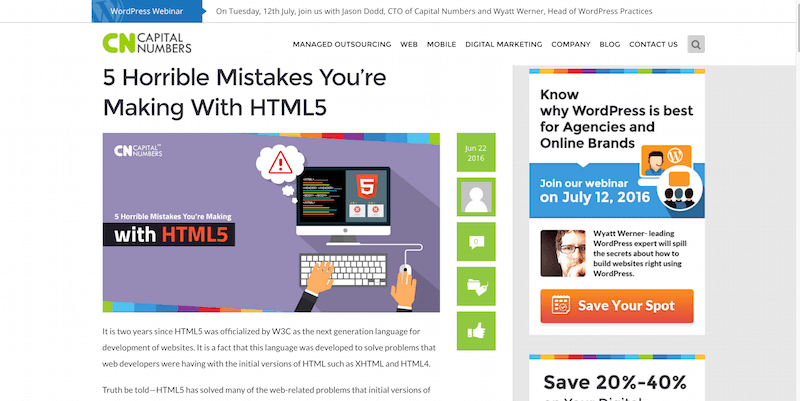 Here you have a nice recap of common HTML5 programming and syntax mistakes that you’re bound to make at least a few times during your web developer career, so explore them, understand them and take the necessary steps to prevent them from happening in the future. What are the common challenges that brands experience when they provide eLearning to their teams? Elucidat covers a nice range of important points that you’ll commonly experience when trying to teach something to large groups of people, in this specific case the subject is HTML5. H5P provides developers with the necessary tools to create rich and reusable HTML5 content within any app development contexts. You can use the H5P plugin to add this rich reusable content functionality to your Drupal or WordPress websites. H5P provides many layers of content types that will enrich your website appearance tenfold. Some of them are, an accordion for creating item lists that can be expanded or collided. It has a video chatting widget so you can interact with your visitors through a truly meaningful medium. It also has an algorithmic widget for creating different ranges of quizzes. Moreover, it has a charts generator so you can quickly show the latest research data you’ve acquired. It also has a wonderful widget for building collages out of images. 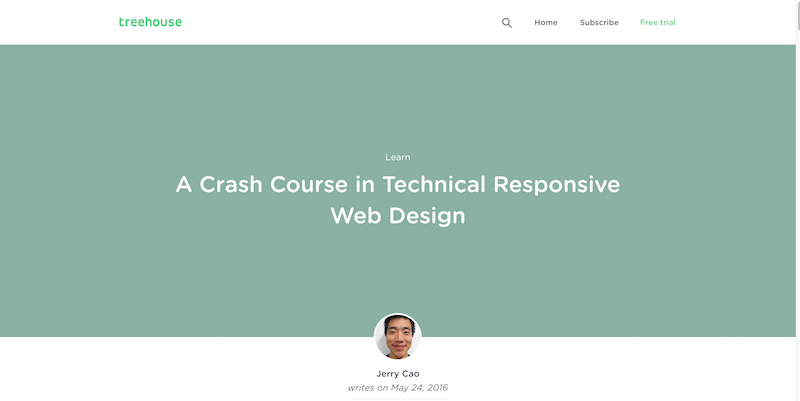 Lastly, it has a stunning widget for presenting your courses directly onto your website and a lot more wonderful widgets. It will take some time to learn about them all. But, these widgets could completely change the feel of your website and certainly appeal to audiences that values interactive features. H5P is designed around reusable building blocks called H5P libraries. For instance, there are H5P libraries for adding video, images, and sound to your content and for creating UI elements. All existing H5P content types have also been designed to be reusable. If you need question types in your content type it will only take a few minutes to plug one in. You can choose from 10 existing question types and they will all follow the same question type contract. HTML5 is coding, right? More than coding it’s also a tool for designing a website. CSS3 can add those wonderful layers of style and color, but HTML5 holds all of those little neat properties together. It’s what helps to finalize the execution of your creative idea for an app, website or a mobile game. 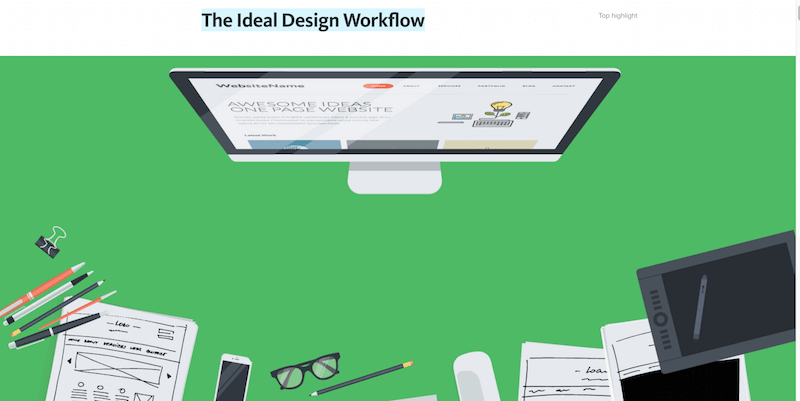 The ideal design workflow is a nice little guide that shows you how you can do more, without spending as much. It’s a presentation, a recap of sorts, that showcases what are the best tools to use when you’re designing a new project, tools that will end up saving your productivity. The humor can seem a little satire, but it’s all fun in the end. Take a quick look and see which one of the tips are sticking with your current workflow, and perhaps you can reshape it to make sure that you’re getting done more while working less. Responsive design tutorials and guides will only get more concise and more in-depth as we move towards a global phenomenon. It’s where majority of internet users will be browsing from their smartphones. It’s imperative that you know the ins and outs of responsive design. It’s going to be a large portion of your website visitors who will visit from their mobile devices. People simply don’t have the patience to sit through a desktop mode website. This happens especially of the owner of the website couldn’t be bothered to do something about it. Learn from one of the best in the industry on how you can perfect your pixel-perfect designs. 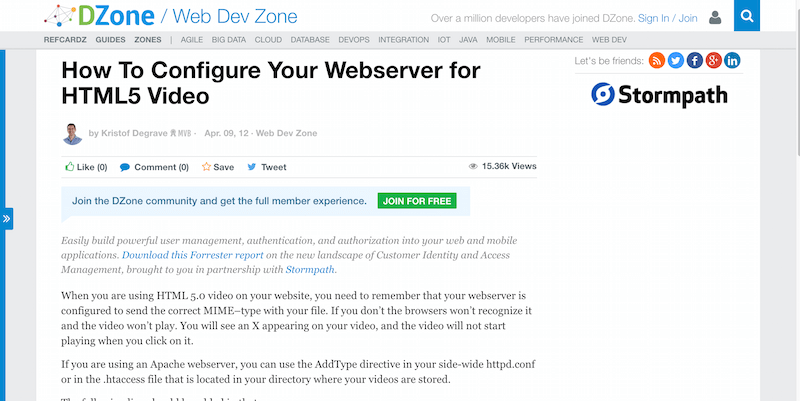 You need to do this so that they turn smooth, responsive and flexible in any device. Cards designs are making their debut heard, everywhere. 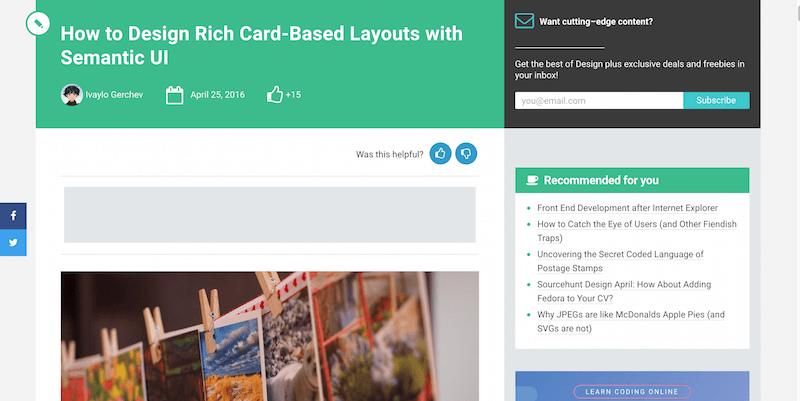 From Google to Pinterest, to mobile applications — everyone is beginning to embrace the beauty of greatly designed card designs. Tutorials are also pouring in from all sides on how to make the most of this wonderful new trend. Semantic-UI provides a similar set of tools and components that Bootstrap does, but of course in a more semantic markup. For this tutorial, you have a nice rundown of how to use the Semantic-UI to achieve a flawless card design. You need design to be ready for implementation on any website you’re currently working on. The final code setup is available on JS Bin where you can yourself play around with the design. Perhaps, you can make custom adjustments as you see fit for your projects. Testing isn’t only for heavy programming languages. 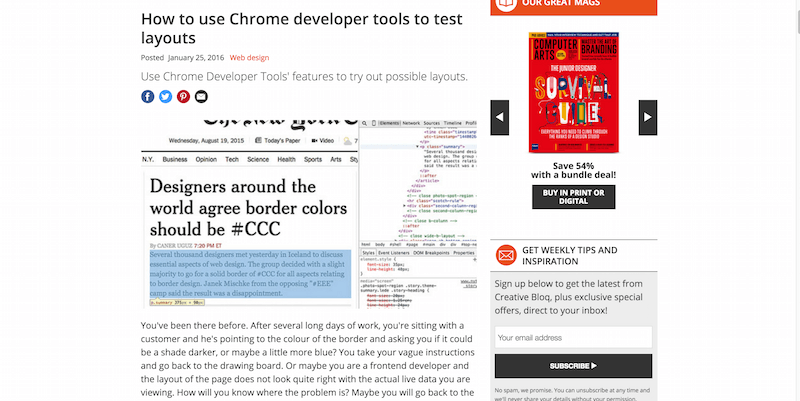 Testing, in fact, will always remain an integral part of web design. Without testing, you’re simply betting on your own abilities to develop a flawless website without any errors. Typically, it’s never going to be the case because there’s too much that goes into a single design. The only way to ensure that this design is stable is through testing. Many libraries exist these days to conclude HTML5 and CSS3 testing. But perhaps, the one that you’ve overlooked all this time is plugged right into your Chrome browser. It’s called the Chrome Developer Tools. It’s a suite of tools for front-end developers that you can use to test and analyze your designs in real-time. This goes directly in the browser. There are two approaches you can take which will help you improve how you work with these tools. If you are starting a new project, code the HTML first and then simply play with the rules. The first draft of the HTML will go through the Dev Tools. You will see that the instant application of your changes will save you time as you refine your project. 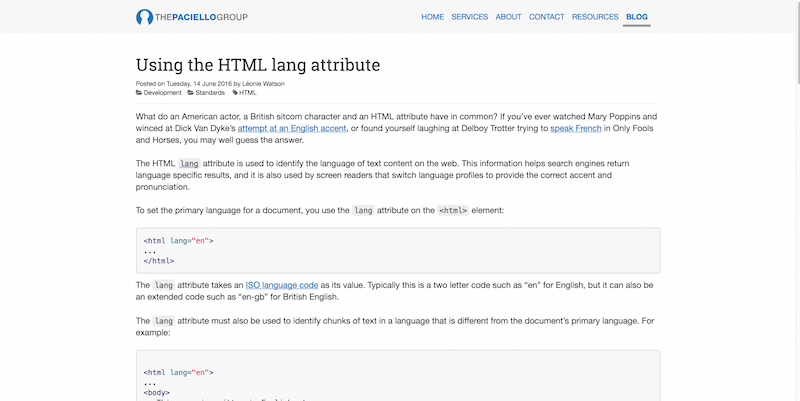 The language attribute in HTML5 helps you to specify the kind of a default language your website is using. That specification, in turn, helps robots and remote tools to understand how to crawl and index your website. You don’t want to use a Spanish language attribute on a website that’s only in English. The same applies to the vice versa situation. A problem might arise when you’re structuring a new website from scratch based on a book or a tutorial. That would typically happen because you’re following a guidelines of rules that have been written months. This would even take years before you bought the book. In those (not so rare) cases, you will be building websites with outdated techniques and methods. We want to present you with a different approach to speed up your learning. You can even keep your books, because the technical information is invaluable regardless. 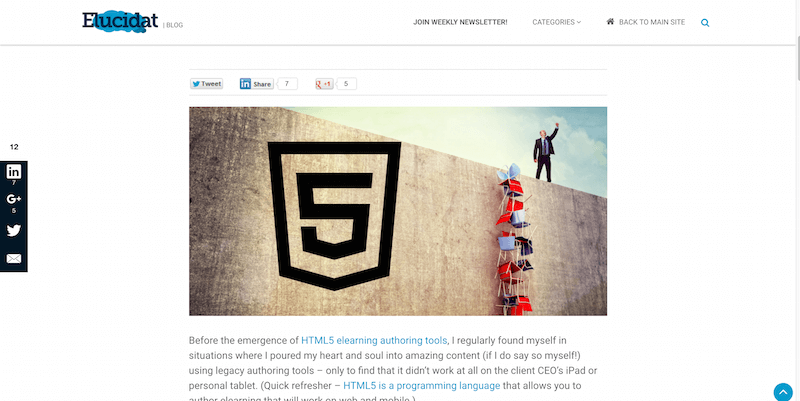 HTML5 UP! is a responsive website template collection. We’ve covered their themes on some occasions, and we’re incredibly pleased with its design and its impeccable overall structure. 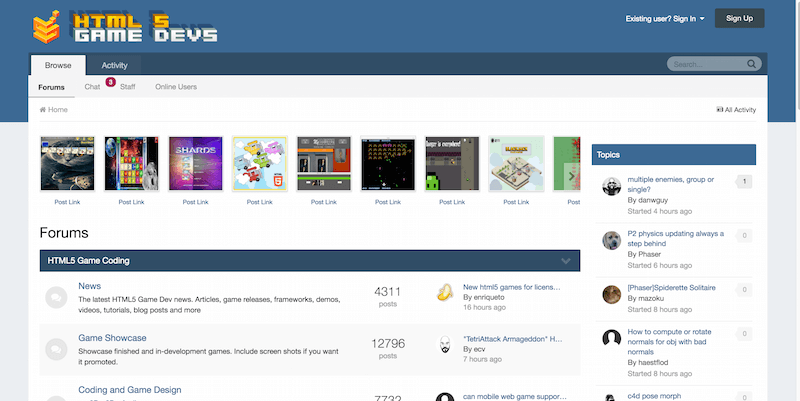 Our recommendation then is for you to use this beautiful themes as learning tools. You should also download their source code and explore it to the fullest. Pull up your code editor on one side and your browser in the other. You will see how each of the elements are in-built within the design. You can learn these techniques for yourself and apply it to your own designs in the future. Sounds fairly easy right? Well it actually is, and you can do this for any kind of free theme websites out there. It’s a quick way to learn about new design concepts and how to use them in your own workflow. 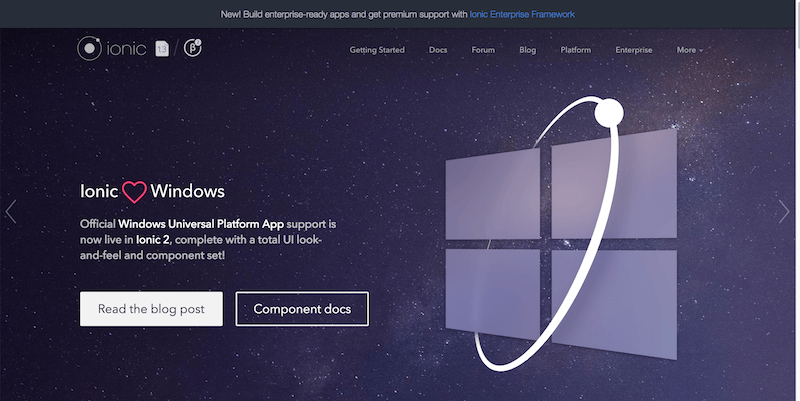 Ionic is amongst the most advanced and most developed HTML5 frameworks on the market. There’s not much that Ionic can’t do, but there’s so much that it actually can do. Leading brands and technology companies are proud to admit that they’re also users of the Ionic framework. They use it both for mobile and desktop applications. Ionic embraces web performance and has been known to be one of the speediest hybrid frameworks around. Also, it embraces Angular technology. You’re always building and prototyping with the most advanced web development features out there. Stunning design and a certain feeling of ease to use is what makes Ionic smash competition down the drain. 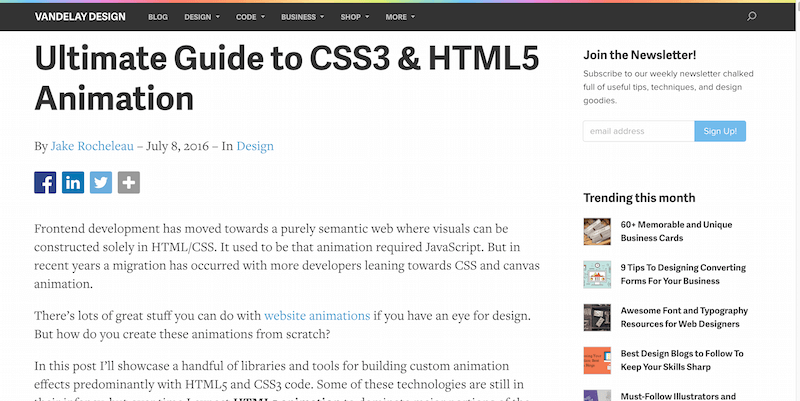 We did recommend to you a selection of HTML5 animation tutorials. We totally understand if you’re not looking to follow them. Sometimes, animation can be a little bit tricky to master. For those situations, we couldn’t recommend enough the famous Animation software. 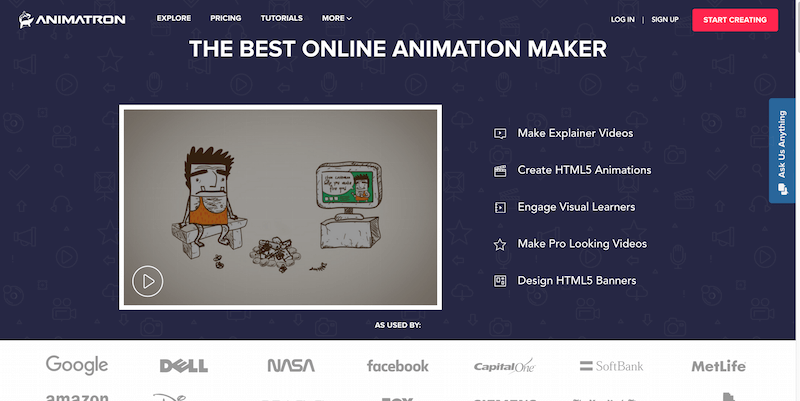 It’s a reliable online tool for creating videos and animations all based on HTML5 technology. It’s perfect for brands who want to make new advertising videos. Also, it’s perfect for tutors who need to make an introduction video to their course. 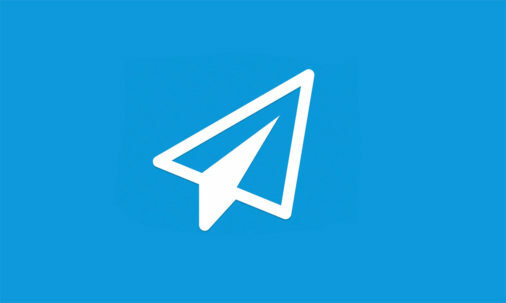 Moreover, it’s perfect for developers who want to use some HTML5 animation magic on their websites. World of advertising is changing every single day. Adblockers are stopping webmasters from earning their hard earned revenue. With this, different companies are trying to sprout up to do something about it. 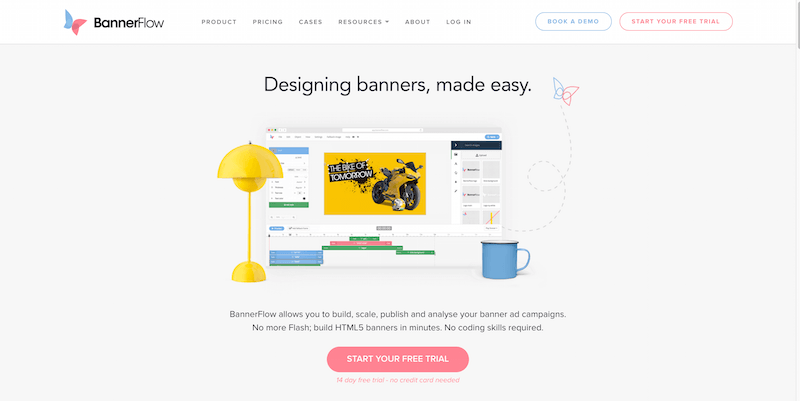 BannerFlow does provide a great environment for building HTML5 banners that will be visually acceptable. The developers certainly built it with precise web technology so that they’re friendly to all modern browsers. Create custom banners and if you desire you can even monitor their individual performance.